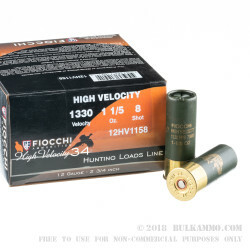 This 12 gauge ammunition from Fiocchi uses a high velocity load that can help you bring down birds at extended ranges. 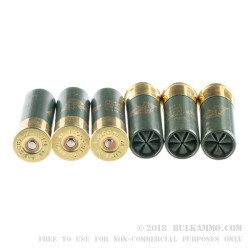 Each shell fires a 1 1/5 ounce column of #8 shot at 1,330 feet per second. 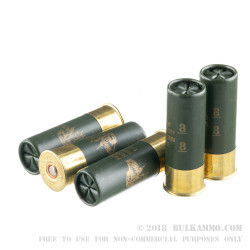 These shells fire lead shot suitable for hunting upland birds and breaking clay targets. For waterfowl, check out the inventory of steel shot instead. 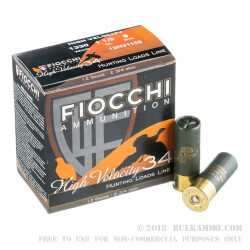 Fiocchi is an Italian ammo manufacturer that was founded in the 1870s. The company produces most of its ammo for the US market in Ozark, Missouri.